Struggling songwriter Dave Seville (Jason Lee) opens his home to a talented trio of chipmunks named Alvin, Simon, and Theodore, and they become overnight music sensations. But when a greedy record producer (David Cross) tries to exploit the "boys", Dave must use a little human ingenuity and a lot of 'munk mischief to get his furry family back before it's too late! $44.307 million on 3475 screens. If you look at the 10 highest grossing flicks of 2007, Alvin and the Chipmunks provides unquestionably the biggest surprise. An unassuming little animation/live-action hybrid update of the old David Seville characters came with little hype among many bigger hitters in the holiday season. Nonetheless, the flick surpassed virtually all expectations and made a stunning $215 million at the box office. The vagaries of the “family film” market continue to confound me. Some believe audiences are so starved for relatively inoffensive material that almost anything in that category will score big bucks. However, this ignores the reams of quality “family friendly” efforts that tank. What made Alvin different? I have no idea, but something about it really appealed to mass audiences. 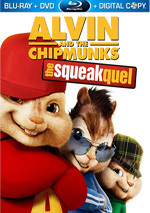 The flick introduces us to a trio of chipmunks: Alvin (voiced by Justin Long), Simon (voiced by Matthew Gray Gubler) and Theodore (voiced by Jesse McCartney). When their home gets cut down to become a Christmas tree, they stay on it and end up delivered to the offices of Jett Records. Dave Seville (Jason Lee) works as a songwriter, but he seems to have lost his muse. Record exec Ian Hawke (David Cross) –an old college classmate – tells Dave to give us the cause because songs boast no commercial appeal. Enter the talents of our homeless chipmunks. They stow away in a muffin basket Dave steals from the record company and freak him out when he discovers them. After a rough start, Dave discovers that the rodents can sing like nobody’s business and he hatches a plan to revive his career. Inspired by their dreams of a happy Christmas, Dave quickly churns out a number called “The Chipmunk Song (Christmas Is Here)”. After some snarls, the tune rockets to the top of the charts and the chipmunks become a pop sensation. The movie follows their adventures and the inevitable snags along the way. We constantly hear about how audiences crave family films. That seems to explain the success of Alvin, though it doesn’t tell us why some flicks of this sort prosper and others tank. What about Alvin turned it into a megahit while other family-oriented pictures bombed? I’ll be darned if I know. I guess there existed an untapped market for computer animated rodents. Maybe crossover appeal worked here, as adults who grew up with the Chipmunks might want to share the nostalgia with their kids. Those are some theories, but I really can’t figure out the answer, as I find little here to distinguish Alvin from most other family flicks out there. That makes it neither bad nor good – it’s just “there”, without a whole lot of spark to lead me to figure out why it turned into a smash. On its own merits, Alvin presents a mildly entertaining spectacle. It throws a lot at us and hopes some of it will stick. Clearly kids will get more of a kick out of the gags than adults will, although the flick tries to fling a few nuggets in the vague direction of the parents in the audience. A few mildly sly references come along for the ride, but the vast majority of the comedy remains aimed firmly at the youngsters. At least the actors occasionally help make things more palatable for the adults. Cross provides a reasonably weaselly and amusing turn as the sleazy record company exec, and we also find a short but amusing turn from Jane Lynch as Dave’s boss; I wish we got more of her. I like Lee as a presence, though I wouldn’t call him much of an actor; he shows his usual broad work here, and a few small laughs emerge. Overall, however, Alvin comes across as a bland and forgettable flick. I find it hard to muster much to say about the movie just because it’s so relentlessly ordinary. It creates a minor distraction for 90 minutes and then completely leaves your mind. Footnote: stick through the end credits for a look at Chipmunks album covers throughout the years. Alvin and the Chipmunks appears in an aspect ratio of approximately 1.85:1 on this Blu-ray Disc. The movie consistently looked very good. Only a few minor sharpness concerns appeared. A few shots demonstrated light softness, usually in wider images. The vast majority of the flick looked well-defined and accurate, though. No jagged edges or shimmering occurred, and edge enhancement remained minimal. I saw no source flaws either during this clean presentation. Though I expected a candy-colored palette for Alvin, the flick actually went with a moderately subdued set of tones. Hues stayed on the natural side, with a mild golden tint to things. Within those parameters, the colors looked fine. Blacks were dark and firm, while shadows appeared clear and well-developed. The mild softness was the main reason this transfer fell to a still strong “B+”. Not a lot of action came with the DTS-HD MA 5.1 soundtrack of Alvin and the Chipmunks. The soundfield stayed pretty subdued through much of the flick. The forward speakers brought out general atmosphere as well as a few minor examples of movement. Elements wound up in logical spots, but they just didn’t have a lot to do. Music showed good stereo imaging, at least, and the surrounds added moderate ambience. This wasn’t what I’d call an active mix, though. Audio quality was fine though also unexceptional. Speech seemed concise and crisp, without edginess or other issues. Music seemed clear enough, though the score and songs didn’t come with a lot of oomph; low-end was somewhat lackluster. Effects sounded fairly accurate and distinctive, though they also didn’t pack a lot of punch. All of this was good enough for a “B-“, but I wouldn’t call this a memorable mix. How did the picture and audio of this Blu-ray Disc compare to those of the original release? Audio seemed about the same. This was a low-key track and I didn’t think the lossless DTS mix managed to bring out anything not heard on the old DD version. Visuals got the usual bump, however. The Blu-ray boasted the standard improvements in terms of clarity, definition and color reproduction. I thought the DVD was fine, but the Blu-ray worked better. The Blu-ray replicates the extras from the original DVD. A featurette called Hitting the Harmony runs eight minutes, 54 seconds and presents movie clips, behind the scenes shots, and interviews. We hear from executive music director Ali Dee and producer/vocalist Alana Da Fonseca. We learn about the songs for the flick and the recording process. Much of this seems fluffy and promotional, but I really like the bits that show how the do the Chipmunk vocals; it’s a hoot to watch the performers sing in half-time. Those parts alone make “Harmony” worth a look. Chip-Chip-Hooray: Chipmunk History lasts 12 minutes, 18 seconds and features thoughts from producer Ross Bagdasarian, Jr. and producer Janice Karman. Bagdasarian discusses the career of his dad and how the Chipmunks came to exist, and we also hear how the younger Ross resurrected the franchise in the 1980s. We learn a fair amount about how the Chipmunks started and developed over the years. Some Previews appear under “Fox on Blu-ray”. This includes ads for Ice Age – The Meltdown, Night at the Museum and Eragon. No trailer for Alvin shows up here. Alvin and the Chipmunks became a major left-field hit, but I can’t figure out why. The film offers mild amusement but nothing much to make it stand out from the crowd. The Blu-ray gives us good picture, ordinary audio, and some mediocre extras. 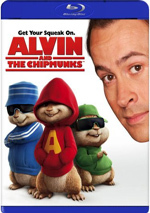 This is the best presentation of the movie on home video, but its lack of substantial extras – and the absence of a particularly entertaining film – makes it hard for me to recommend it to anyone not enthralled by Alvin.